FAREHAM HEATHENS travel to New Milton in the Hampshire premiership looking to regain some form. Dave Wheaton has been concerned by his side’s slide down the league and sit fourth from bottom. The player-coach believes the Heathens’ first-half performances are proving their downfall. He wants to see a better side from his troops on Saturday. ‘Our recent poor results has left us fourth from bottom,' said Wheaton. ‘I always knew this league was going to be tough. 'But poor first-half performances are proving costly. ‘We always seem to get going in the second half and that needs to change. 'Numbers are beginning to drop off in training and availability at weekends is low. ‘The lads who do train are putting their heart and soul into every session. ‘We have decided to go with a new-look side this weekend with several second-team squad players selected for the senior squad. Youngster Sam Lockwood is in line to get a start at openside flanker and Jon Corner comes in at number eight. Rikky Curtis, inset, could move inside to centre from his usual position of openside. Gary Wootton will join the squad as tight head and Dave Richardson should get a start on the wing. Wheaton added: ‘We need to fire from the start because New Milton are a strong outfit at home. 'If we can put some early points on the board then our confidence will grow. 'With some hard-tackle practice at training, I’m expecting the lads to get stuck in from the start. Meanwhile, Gosport & Fareham journey to Old Tonbridgians in London two south west. 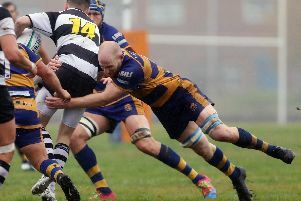 Gosport sealed a home win over London Exiles last time out. In Hampshire two, Locks Heath Pumas take on Andover II.